Water bath for flattening out and drying tissue sections in histology, pathology, chemical, clinical and bacteriology laboratories. 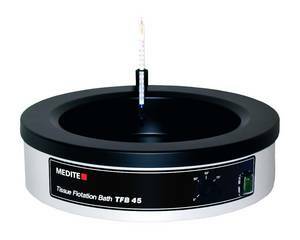 The tissue flotation bath TFB 45 provides a circular water bath with exact mechanical temperature regulation. Its bath well and edge are made of high quality aluminium with black coating. This special surface provides higher protection against localized corrosion as compared to an Eloxal coating. The working temperature range of the tissue flotation bath extends from + 30° C to + 90° C. It is regulated by means of temperature control unit and can be adjusted to the exact value of +/- 2° C.
In addition, the following accessories are recommended: Lid made of aluminium with black coating, totally protecting the water from dirt, Thermometer 0 - 100° C, thermometer holder. TFB 45 accessories are also available individually.